The kernel boots up but I didn't get anything started after that. What's wrong? Is it a kernel mismatch with the latest release of Raspbian? Try this. Hope it will work. I am doing the same thing as you. 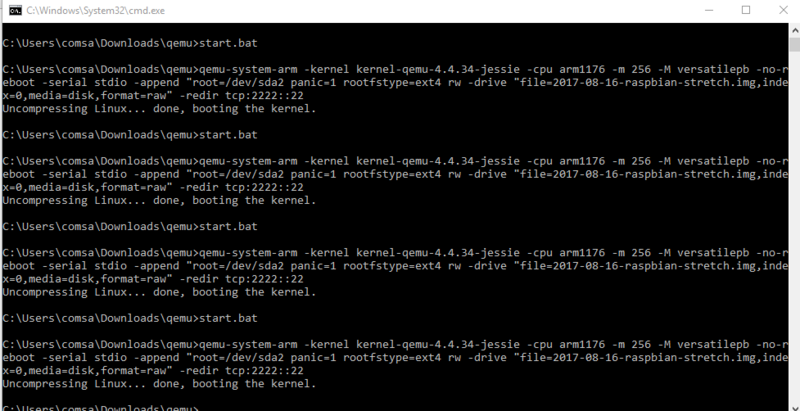 qemu-system-arm.exe -M versatilepb -cpu arm1176 -hda 2017-08-16-raspbian-stretch.img -kernel kernel-qemu-4.4.34-jessie -m 256 -append "root=/dev/sda2"
Not the answer you're looking for? Browse other questions tagged kernel qemu or ask your own question.